German industrial titans KMFDM have released 'Krieg,' the remix companion to 2009's 'Blitz.' Get it? 'Blitz,' 'Krieg' -- blitzkrieg. The remix record features 12 tracks redone by former and current members of hard rock icons like Nine Inch Nails, White Zombie, Danzig, Ministry, Prong and ex-members of even KMFDM, to name a few. 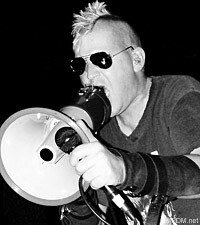 Founder Sascha Konietzko weighed in on the popularity of remixes in the industrial scene, telling Noisecreep, "I was heavily into remixing in the late '80s and early '90s, from a reggae dub approach, and I was deconstructing existing songs and dubbed them out. I got hired to do Metallica and White Zombie remixes. I did hundreds of them. They bored me and I stopped, but over the last two or three years, I thought, 'Let's do a remix record.' It worked, since it was the right participants who brought this up a notch and created a product that stands on its own." Konietzko gave 'Krieg' remixers carte blanche to do whatever they damn well pleased to his existing songs. "I was touring heavily and didn't have time, so a young man took over the role of recruiting the talent as producer and organizing the whole thing," he said. "I was presented with a list and was mighty pleased, and said, 'Yeah, sure, go ahead.' I couldn't have found a better team of remixers!" He didn't offer too much input, saying, "The only thing I dared to say to someone I respect as remixer was to turn a vocal up or down. I won't dissect someone else's work. I don't like someone going into my work like that, so I won't." However, when game developers would call him about remixes, he had to give a wee bit of guidance. "They would ask, 'Can we mute the kick drum?' and I'd say, 'Yeah, but the beat is gone.' Or 'Can we take the bass out?' Then I thought, 'Then you just have high-end snare.'" He feels 'Krieg' "hits the spot more than some [remixes] we've done in the past. It spans the gamut better and it's not all dark, electro stuff. It's surprising and cool to have a song remixed into piano/ballad material." 'Krieg' is exclusive to KMFDM Records and available only at KMFDM's official Web store in both CD and high quality MP3 digital formats.